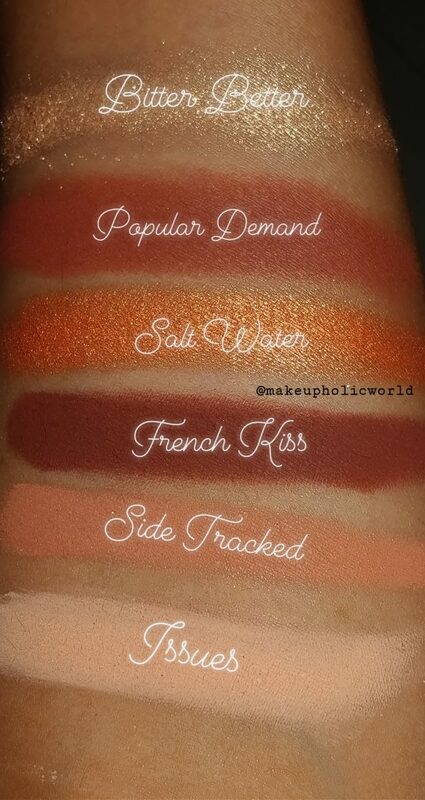 Colourpop Cosmetics’ve been my favorite brand lately. 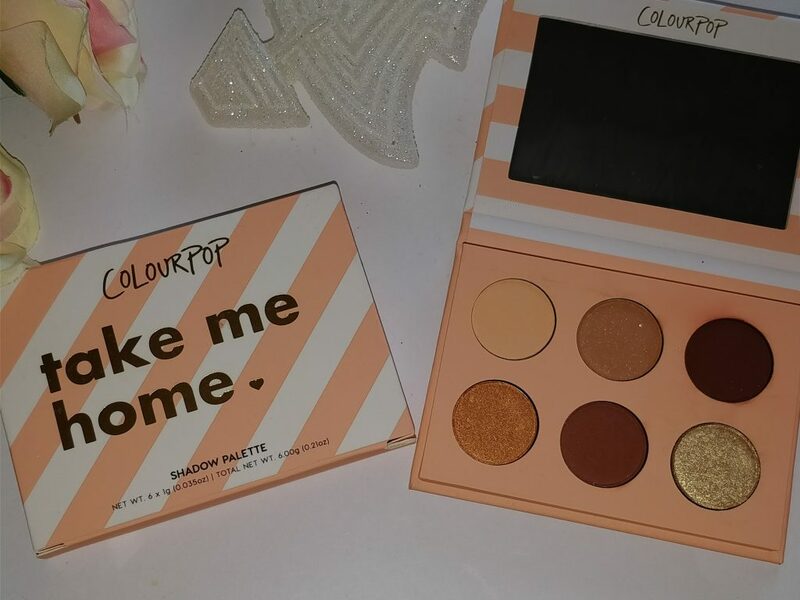 I rarely miss any of their new launches and this mini palette that features warm-toned shades, a mix of matte and metallic finishes was my first purchase of COlourpop from Sephora. Initially, this mini palette was only launched on Sephora- later made available on official site as well. First thing that attracted me is it’s thoughtful name. 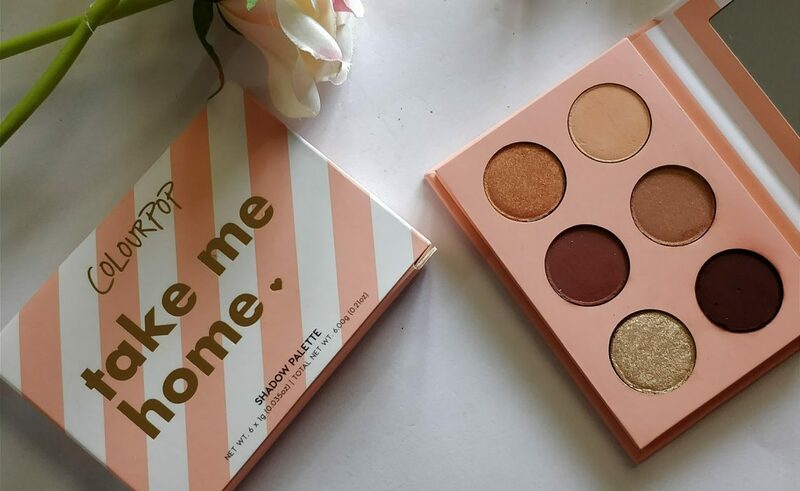 OMG, how can I resist this ‘TAKE ME HOME’ ; This name of the palette itself is very tempting. 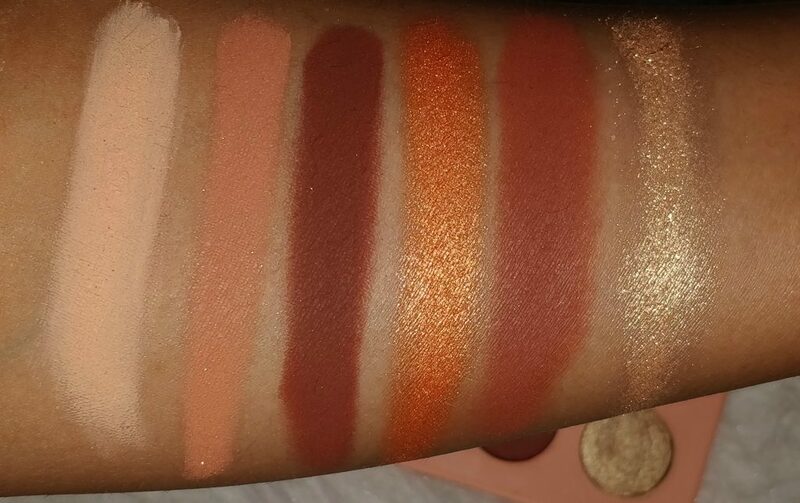 Basically, this palette features beautiful Oranges/Corals, Browns, Neutrals & Gold. I am obsessed with the shades. There is not even a single shade that I wouldn’t wear. 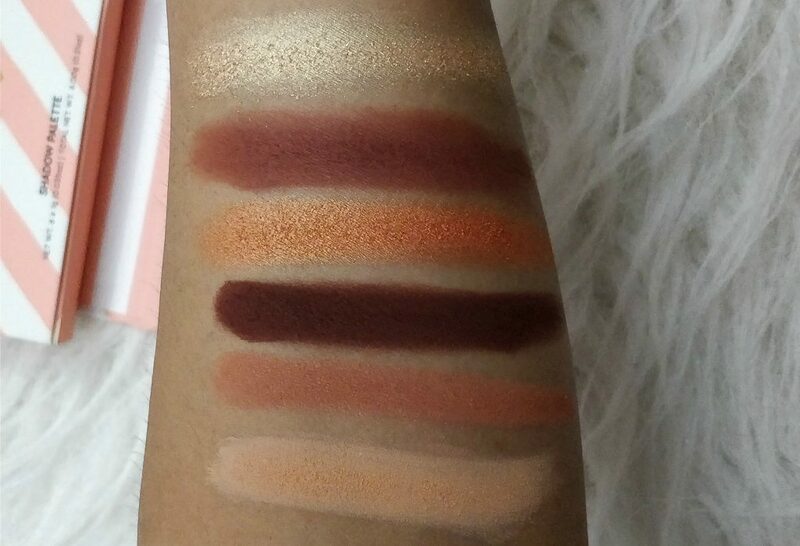 Perfect palette for day as well as night time looks. Formula – It feels really silky or velvety smooth while touching. Easy to pick up on the brush and apply. I love the formula. All of the colors were easy to blend and apply. The matte shade ‘ Issues’ when touched using fingers appeared a lil powdery. I felt the texture is really powdery. The shade is a bit loosely pressed in and so It gives a lot of powder mess while picking the product. I experienced the same issue for other matte shades as well. You might want to apply this on top of a eye base or a creme base etc to avoid patchiness while applying. Shades – To talk about the shades – Honestly I felt these were repeats of the colors that other palettes already have. 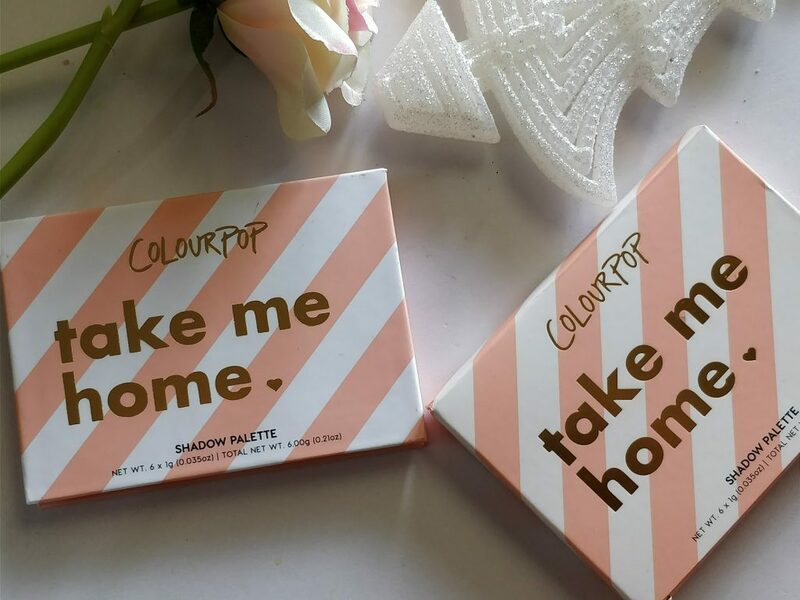 Not very exciting or new shades for anyone who already own most of their palettes. Pigmentation – I am really happy about how intensely pigmented these shades are. They can be used dry/wet. The best way to apply these are – Pack the color on your lids which is primed using an eye base using a flat shader brush and once the color is packed well. you may use a blending brush to precisely clean the sharp edges and give it a smooth and silky finish. Longevity – I wore them for about 5-6 hours without any fading. While applied wet on my lower lash line, It gave a feathered intense effect that I liked and I think I like to use the darker colors using a wet brush. Issues: Synthetic Fluorphlogopite, Talc, Boron Nitride, Zinc Stearate, Lauroyl Lysine, Magnesium Stearate, Dimethicone, Caprylic/Capric Triglyceride, Silica, Phenoxyethanol, Caprylyl Glycol, Dimethiconol, Ethylhexylglycerin, Hexylene Glycol, Tin Oxide, Mica (CI 77019), Red 40 Lake (CI 16035), Titanium Dioxide (CI 77891), Yellow 5 Lake (CI 19140). Side Tracked: Synthetic Fluorphlogopite, Talc, Boron Nitride, Zinc Stearate, Lauroyl Lysine, Magnesium Stearate, Dimethicone, Caprylic/Capric Triglyceride, Silica, Phenoxyethanol, Caprylyl Glycol, Dimethiconol, Ethylhexylglycerin, Hexylene Glycol, Tin Oxide, Iron Oxides (CI 77491, CI 77492, CI 77499), Mica (CI 77019), Red 40 Lake (CI 16035), Titanium Dioxide (CI 77891). French Kiss: Zinc Stearate, Boron Nitride, Lauroyl Lysine, Dimethicone, Phenoxyethanol, Caprylic/Capric Triglyceride, Caprylyl Glycol, Magnesium Stearate, Synthetic Fluorphlogopite, Talc, Ethylhexylglycerin, Hexylene Glycol, Dimethiconol, Silica, Tin Oxide, Blue 1 Lake (CI 42090), Iron Oxides (CI 77491, CI 77492, CI 77499), Mica (CI 77019), Red 40 Lake (CI 16035), Titanium Dioxide (CI 77891). Salt Water: Dimethicone, Synthetic Fluorphlogopite, Boron Nitride, Silica, Lauroyl Lysine, Magnesium Stearate, Dimethiconol, Phenoxyethanol, Talc, Caprylyl Glycol, Ethylhexylglycerin, Hexylene Glycol, Tin Oxide, Triethoxycaprylylsilane, Bismuth Oxychloride (CI 77163), Iron Oxides (CI 77491, CI 77492, CI 77499), Mica (CI 77019), Red 40 Lake (CI 16035), Titanium Dioxide (CI 77891), Yellow 5 Lake (CI 19140). Popular Demand: Synthetic Fluorphlogopite, Talc, Boron Nitride, Zinc Stearate, Lauroyl Lysine, Magnesium Stearate, Dimethicone, Caprylic/Capric Triglyceride, Silica, Phenoxyethanol, Caprylyl Glycol, Dimethiconol, Ethylhexylglycerin, Hexylene Glycol, Tin Oxide, Blue 1 Lake (CI 42090), Iron Oxides (CI 77491, CI 77492, CI 77499), Manganese Violet (CI 77742), Mica (CI 77019), Red 40 Lake (CI 16035), Titanium Dioxide (CI 77891). Bitter Better: Dimethicone, Boron Nitride, Synthetic Fluorphlogopite, Lauroyl Lysine, Magnesium Stearate, Dimethiconol, Phenoxyethanol, Talc, Caprylyl Glycol, Ethylhexylglycerin, Hexylene Glycol, Triethoxycaprylylsilane, Tin Oxide, Silica, Bismuth Oxychloride (CI 77163), Iron Oxides (CI 77491, CI 77492, CI 77499), Mica (CI 77019), Titanium Dioxide (CI 77891). Issues: It’s a good ‘matte’ pastel peach color. Good if you are into cut crease looks. The combination of a darker color and this pastel peach is really beautiful. Side Tracked: A ‘matte’ terracotta shade with gold flecks; no fallouts or anything. But, When touched it feels a little gritty. However, easy to blend and apply. French Kiss: A ‘matte’ medium chocolate brown shade. One of my favorite color from this palette. Salt Water: A ‘metallic’ light golden peach. It’s beautiful with darker shade ‘French Kiss’ combination. Popular Demand: A ‘matte’ red brown shade. Another favorite of mine. Bitter Better: A ‘metallic’ soft gold shade. 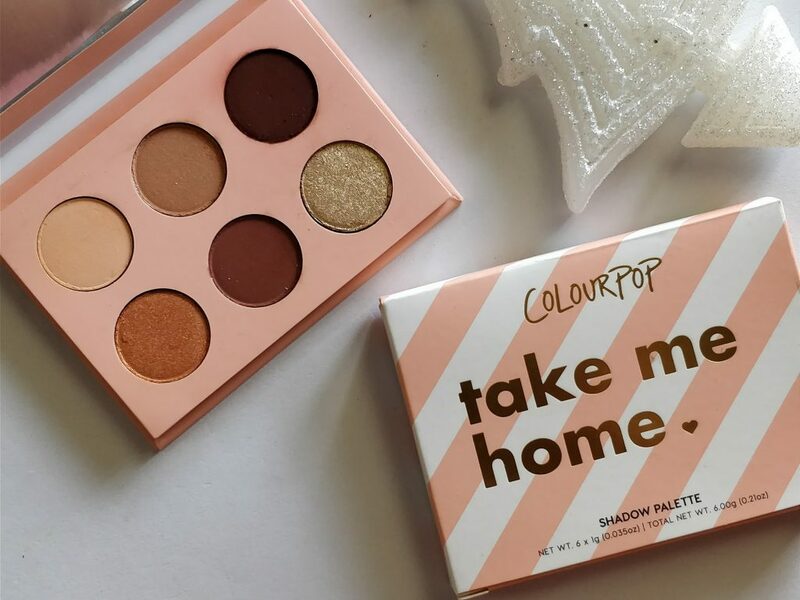 Overall, it’s a good palette if you are looking for a palette with warm toned colors in a pocket size which is easy to carry around. But, Though the texture is silky or velvety. I found it difficult to blend in some of the matte shades. Especially – The shades like ‘Issues’, ‘Side Tracked’ etc. Was quite tough to pick the color using fingers or brush. It appeared powdery and patchy. With a cream base or a primer. These were easy to apply. I don’t regret the purchase as it’s very cute and compact. But, Overall I would say this palette is not one of the best from them. If you have other palettes – You can give this a miss. I am obvious, You will find all these shades in other palettes. 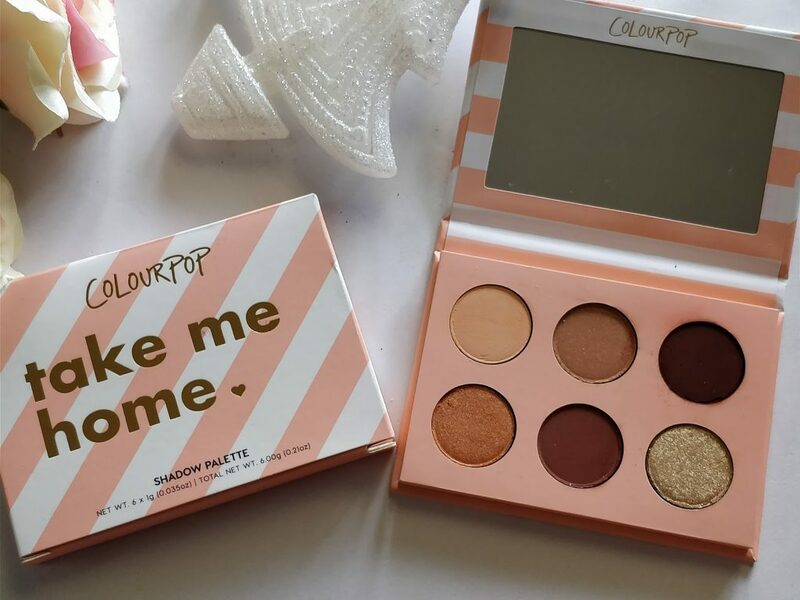 If you are new to colorpop and you are not someone who wear eyeshadows everytime. Then, you can buy this. It’s great for occasional use and also compact to carry around. The in-built mirror is a plus. Not many colorpop palettes except one has an attached mirror. Also, If you have a cool toned skin – You don’t need this. This features more warm toned colors. 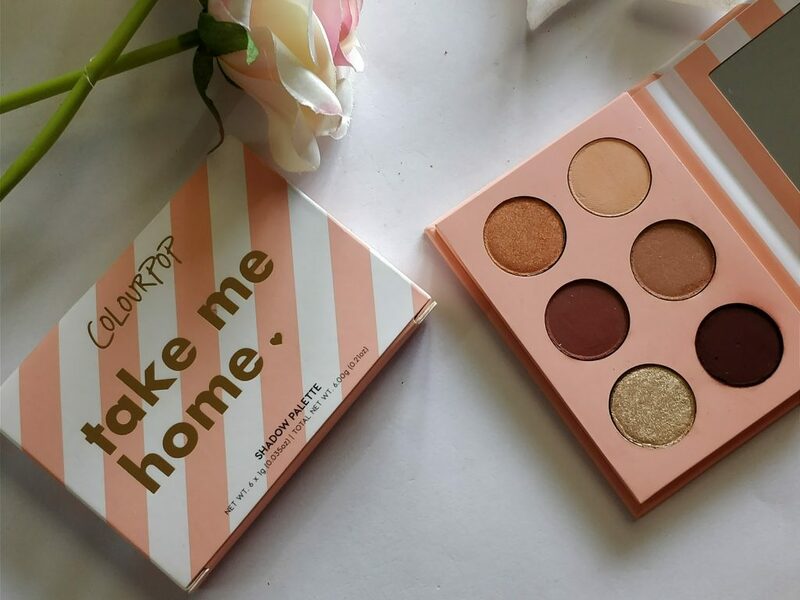 Have you tried Colourpop Eye Palettes ? 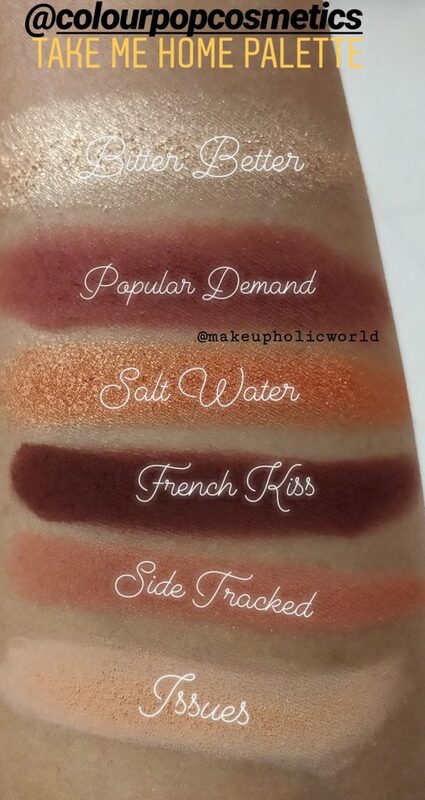 What’s your favorite palette from them ?